authority, she is not prepared to tolerate its abuse. Nor does Marie’s orthodoxy allow her to be complacent about the problem of “la mal-mariee.” The fact that she is even prepared, on occasion, to condone adultery would seem to suggest that her views on the role of women in the Twelfth Century were not quite orthodox. Were secular influences responsible for this independence of thought, or are both secular and religious influences accountable? What is certain is that Marie de France was interested in the Christian ideal of conduct, with its assumption on the one hand of human imperfection, and on the other, of an infinite perfectibility. 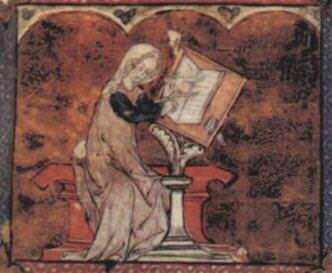 Thus, it would be possible to look upon the combined works of Marie de France as a triptych, i.e. a set of three panels with pictures, designs or carvings, so hinged, that the two side panels may be folded over the central one. The Lais–the most complex of the three works— would be the central panel and the Fables and the Espurgatoire would be the two side panels. Such a triptych would certainly be used as an altar-piece for the greater glory of God.